If you're looking for a free indie RPG that's a little... different... you might want to try Unproductive Fun Time's surreal and unsettling OFF. Recently translated from its native French, the game follows you and The Batter, a stoic slugger whose goal is, he says, to "purify" the land of spectres and phantoms. With the help of an enigmatic and somewhat suspicious toothy cat, you'll travel through the Nothingness to such wondrous places as the Meat Fountains of Alma, to the labyrinthine library of Bismark and beyond, and pack you full of ghosts, profanity, puzzles, and nightmare fuel in the process. Use the [arrow] keys to move around, the [spacebar] to interact, and hit [ESC] to open the menu. Battles are turn based in the most traditional fashion, with characters attacking in turn once their action bar fills up. If you don't feel like manually handling each battle yourself, you can just select the "Auto" option and your heroes will beat on their enemies as they see fit. As you level up, your characters will learn more moves ("Competence") that can help in battle, and, of course, you can find the obligatory, if somewhat disdainful, item merchant who will sell you not only more curative items, but better arms and armor to boot. You can find floating boxes that will restore your health and save your progress, but only the red ones will allow you to teleport to another Zone by returning to the Nothingness. Analysis: OFF is a weird game. I mean, seriously. Imagine a giant laboratory with beakers bubbling away, distilling games like Earthbound, Killer 7, Baroque, and maybe a little bit of Stephen King and Peter Straub's Talisman, and the roiling, unsettling liquid they combine to make might look a little like this. The characters and landscapes you visit are bizarre to say the least, and the way you're thrust into them with no explanation or warm-up is more than a little disorienting in a way that can frustrate some players. The unique mythology you see peeking through in the conversations and designs is absolutely fascinating, however, and if you're a fan of surreal, introspective stories where what you know is only part of a bigger mystery you'll definitely want to check this one out. From its swanky and stellar original soundtrack by Alias Conrad Coldwood, to its unusual concepts and strange character designs, OFF feels like its own unique creature in ways few games rarely manage. The downside? Apart from a healthy dose of solid, clever puzzles, it really does feel like OFF's unique story and concept is struggling to carry the gameplay at times. Unless you grew up gaming in the '80s and '90s like I did and are just used to it, random battles are the smelly, lurking, unwashed convention goer of the gaming world, and OFF has a lot of them. The auto-attack is actually surprisingly adept at handling nearly any encounter, including boss battles if you're sufficiently leveled, but it definitely gets tedious when all you really want to do is find out more about the story and the universe it lives in. Which is, by the way, seriously worth doing. OFF isn't for everyone, but if it gets its hooks into you you're going to love the off-kilter journey it takes you on. Although the core gameplay is rarely as immediately compelling as the story and the people and places that live in it, OFF is an unexpected diamond in the rough for a particular sort of person. It's definitely worth a look, and a listen, and a thought or several if you don't run for the hills after the first Zone. It's something you can find yourself mulling over, and shows that there's still a lot of creativity (and creepiness) to be found in the simplest of RPG titles yet. Use the arrow keys to move your character the Batter up to the next area. After speaking with the Judge, open the chest at the upper left corner of the island. The chest on the right side is currently blocked off, but you'll be able to reach it soon. Go up the ladder to the roof of the small building to speak with the Judge again. He will offer to show you a combat tutorial which will teach you all the basic elements of battles. Follow the Judge up the ladder to the roof of the tall building, then go down the stairs at the left. Speak with the Judge for a clue on how to solve the puzzle in the room. Note that there are four floating blocks in the room (and three solid blocks blocking the exit). To solve the puzzle, activate the blocks in the same location as the numbers on the wall from 1 to 4. That is, first hit the upper left box, then the lower left box, then the upper right box, and finally the lower right box. When a floating box is hit in the correct order, it will become faded and begin to shake. Go down the unblocked stairs on the right into Room 2. 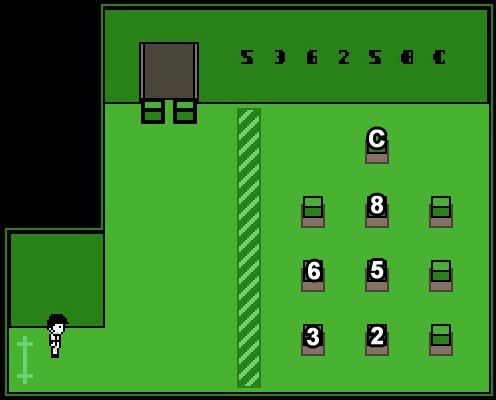 Speak with the Judge again to receive another hint for the floating block puzzle in this room. 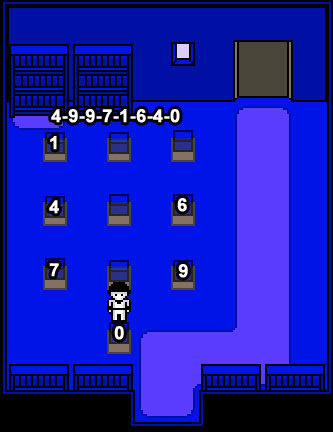 Note that there are eight boxes in the center of the room and six numbers written on the wall, the highest of which is 8. Imagine that the top row of boxes is numbered 1 to 4 from left to right, and the bottom row is numbered 5 to 8. With that in mind, hit the boxes that correspond with the code written on the wall. Hit the far left box on the top row, box 1. Hit the middle left box on the top row, box 2. Hit the middle left box on the bottom row, box 6. Hit the far right box on the bottom row, box 8. Hit the middle left box on the top row again, box 2. Hit the middle right box on the top row, box 3. Go down the unblocked stairs on the left into Room 3. There are floating blocks in this room, but where is the code? For now, go back out to the Island. Open the now unblocked chest to the right of the doorway you just exited from. Go inside the small room at the center of the island. It's the code you were looking for earlier! Commit the code to memory and return to Room 3. Imagine that the rows of blocks are numbered like the buttons on the key pad. In the top row are blocks 1, 2, 3. In the middle row are blocks 4, 5, 6. The bottom row are blocks 7, 8, 9. 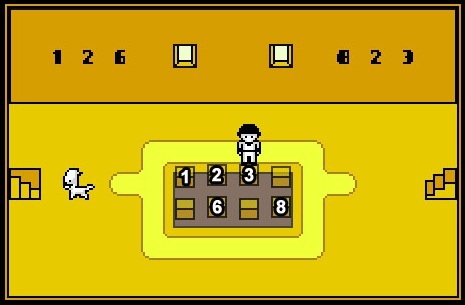 Press the blocks in the correct order using the number clue from the small room in the Island. The letter C in the clue refers to the lone center block at the very bottom. Hit the left box in the middle row, 4. Hit the same box again, 4. Hit the middle box in the bottom row, 8. Hit the middle box in the top row, 2. Hit the left box in the bottom row, 7. 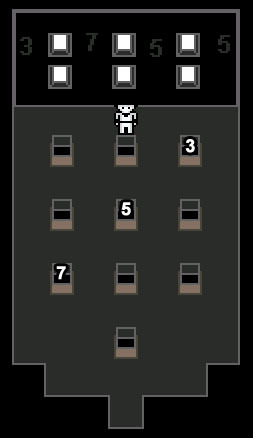 Hit the single box at the very bottom, C.
Exit through the opened door at the back of the room to reach the save point. After you speak with the Judge, you will receive a Leo Card to grant you access to the next zone. Hit the red cube to save your game and travel to The Nothingness. From The Nothingness, move down and enter Zone 1. Note there is a save point at the lower right side of the island at the start of the zone. Continue up to the Elsen tram station. Enter the tram through either door and travel to the Damien station. Go down and right to speak with the miner. Enter the building at the top. Open the chest at the upper left corner of the room. Exit the room, then continue down the stairs into the tunnel. After speaking with the Judge, pick up the white circle at the back of the room to add the Add-On Alpha to your team. Go back up the stairs and talk to the miner again. Continue through the now-unblocked path to the right and go down the stairs to the Main Mine. 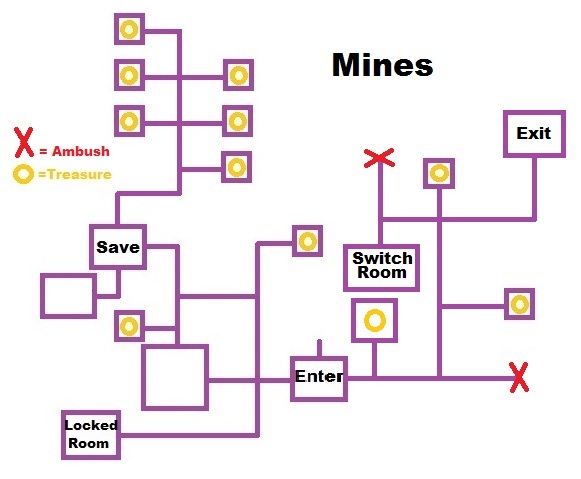 Go right and up to find the mine save point. You will be ambushed by a pack of ghosts when you reach the center of the room. Exit the room to the right to reach the hallway. Continue down and take the first left to find a treasure chest. From there go up, right, up, and right again to find another treasure chest. Go all the way down the ladder and to the end of the hall on the left. One of the torches (the second from the left) isn't lit; press the hidden switch at the lamp to unlock the secret door. Continue left into the unlocked room. Open the chest at the upper left corner of the room, then exit back to the hall. Go up the ladder, then take the first right and continue up the next ladder to reach the surface of Pentel. When you reach this area, one of the miners will approach you to ask for your help in clearing the barns of spectres. Follow the path to the right to reach another save point. Enter the barn directly above you. While inside the building, the text window at the top will count down how many of the 5 spectres are remaining. Move up to enter the next room and fight the first spectre. Go back and down to enter the room on the left to find the next two spectres and engage them in combat. Enter the upper right room to find the fourth spectre. Go back down, then continue to the upper left room and down the stairs to the basement. Push the stones away to clear a path to the last spectre. Refer to the screenshot below for the following solution. Destroy the last spectre and use the grey square tile to teleport back to the barn's entrance. Exit the building and speak with the man outside. 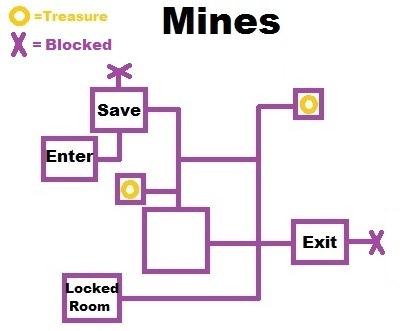 Return to the mines and go all the way back to the save point. When you reach the save point, you'll find the north path has been unblocked. Continue upwards to the new area. At the end of each hall here is a treasure chest. Inside each of the six chests are orbs that allow you to permanently increase your character's stats. When you approach a chest, you will be attacked by a group of spectres. After you have looted each chest, return to the ladder at the etrance from Pentel. Continue through the newly unblocked passage to the right to reach the next area of the mines. Go up at the first intersection to find a treasure chest. Move back down and continue right, then turn up and right again to find another treasure chest. Go back to the left, then move all the way up to find a third treasure chest. Move down, left, and down again to enter the switch room. Turn the switch OFF in the middle of the back right wall. This will unblock the path to the exit. Go up and all the way right to find exit, then move up to find a room with a yellow save cube. Talk to the man standing in the middle of the room, Zachary, to view the item shop. At the item shop you can buy and sell items and equipment for your team. Exit through the door at the top of the room to reach the entrance to Shachihata. After speaking with the man in the basement, use the elevator to travel to the Roof. Use the arrow keys to set your designated floor - 99999, then press enter or spacebar to travel to that floor. Speak with the Judge and ask him for a clue to find the postal service room. "In one of the four rooms on the ground floor, all the employees seem to be trained to a particular set of instructions. Additionally, if there was a choice to be made, I would prefer the lower-case over the upper-case." Use the elevator to travel to the Ground Floor - 00001. Now that you have the Judge's clue, finding the correct floor in this room is actually pretty simple. If you speak to the men standing at the desks at the desks, they will rattle off two series of numbers. In only one of the four rooms do the men all say the same numbers. In the lower left room they all say "Form 2584, stamp 10258. Go to the elevator and enter in the first number (0)2584 to find the Lost Property Office with two treasure chests. Enter in the second number 10258 to travel to the Postal Service. Go into the right room section to speak with the man and engage him in combat. After he's defeated, continue down the stairs to the next floor, Area 1/2. Read the note on the paper to the left of the stairs. "First version: They are six feet under, wrapped in hot metal and liquid plastic." Move left to the middle room section. Read the note on the upper left table. "Second version: They are eight, and they have long beards. They watch what is happening from their high silver spheres." Move left to the left room section. 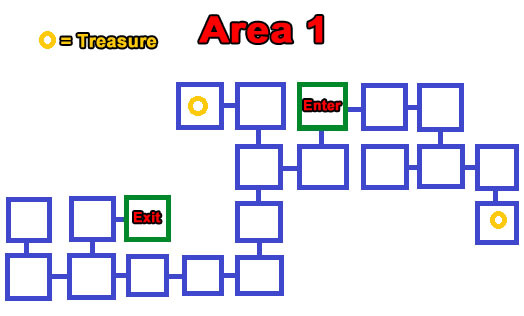 Go down the stairs to the next floor to find a treasure chest, then take the stairs back up to Area 1/2. Move right to the middle room section and take the stairs up to Area 2/3. Read the note on top of the right table in the middle row. "Third version: A sole big insect, whose mandibles spit meat." Move left to the left section of the room. Read the note on top of the right table in the top row. "Fourth version: They are four, each one attributed to an element. They protect their respective crystals." Move right to the right room section and take the stairs up to a blocked off section of Area 3/4. Read the note on the table at the bottom of the room. "Fifth version: Five, like the fingers on a hand. Their lungs produce primordial smoke." Return to Area 2/3, then move to the left section and take the stairs up to the main room of Area 3/4. Read the sixth note on the table to the left of the elevator. "Last version: There are but two, in a secret zone." Talk to the man standing to the right of the elevator. Tell him you must pass, and he will ask you for the code. To discover the clue, find the six numbers from the all the notes in the postal service. The first number is in the first version, second number in the second version, etc. "They are six feet under" = 6. "They are eight" = 8. A sole big insect" = 1. "They are four" = 4. "Five, like fingers on a hand" = 5. They are but two" = 2. Give him the complete code 6-8-1-4-5-2 to start the battle. After defeating the man in combat, enter the elevator to reach The Director's Office. You can heal your team and save the game at the yellow save box in the first room. Continue down into the office. Speak with the Dedan to gain access to the tram in Alma. Return to the elevator and descent to the ground floor, then go straight down to exit the building. Follow the path right and up to the tram to ride to Alma. Follow the path up and go through the door to enter the room. Examine the three pages of the calendar on the back wall for a closer look. The first page is March 18th, the second is June 3rd, and the third is February 11th. After studying the calendar pages, speak to the man blocking the door to answer a series of questions about the calendar pages. Look at the March 18 page to find the answer. You'll see three names at the bottom and their three cities of origin. The first is S. Cyrille de Jerusalem, the second is S. Alexandre de Jerusalem, and the third is S. Salvator d'Orta. Answer: The third from Orta. Study the June 3rd page to find this answer. 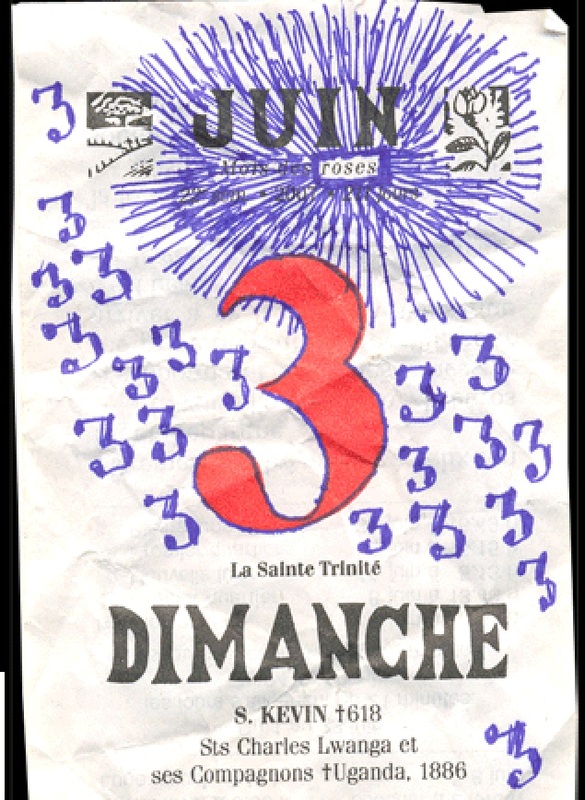 Under the large red number 3 are the words for Holy Trinity in French: La Sainte Trinite. The word "roses" is outlined very clearly at the top of the page. Study the February 11 page to find the answer. 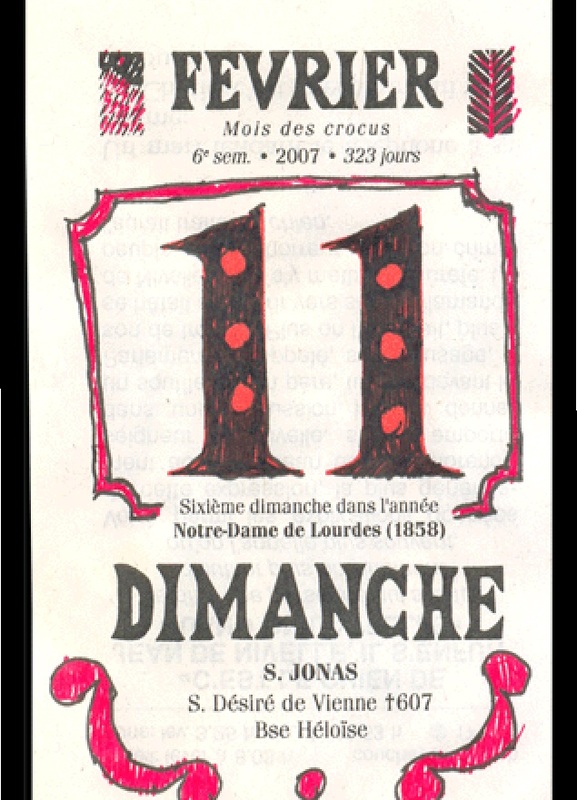 Inspect the area under 11 to view the words "Sixieme dimanche dans l'annee (sixth Sunday in the year), Notre-Dame de Lourdes". Question 4: How many threes are there in June? Count every three on the June page, including the large red 3 in the center and the 3 at the lower right corner. Study all three pages to find the answer. 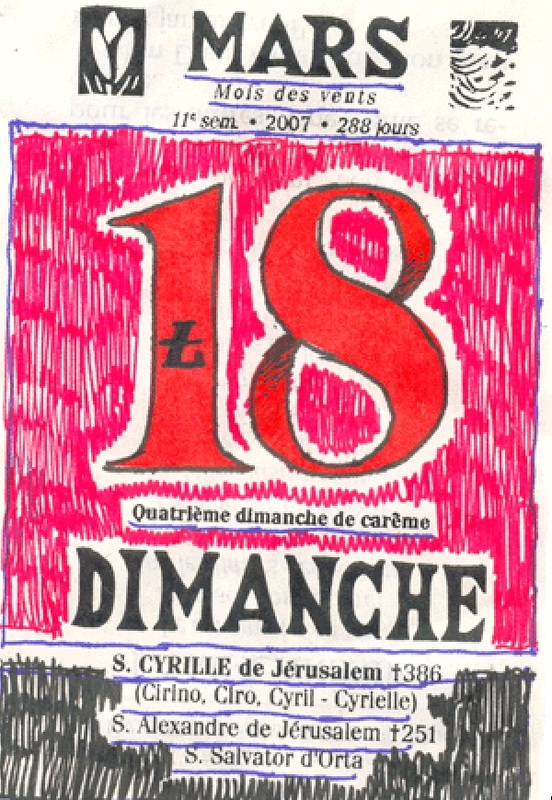 Under the word "Dimanche" on each poster is a name highlighted in bold. On March 18th it's S. Cyrille, on June 3rd it's S. Kevin, and on February 11 it's S. Jonas. Questoin 6: If you turn the month March (Mars) upside-down, what number can you read? Study the March 18 page to find the answer. When the page is turned upside-down, the number 8 stays the same, but the black "L" inside the number 1 now looks like a 7. If you answer all of his questions correctly, the man will attack you. After defeating him in combat, exit through the door at the top of the room. Move up to speak to the worker and engage him in combat. Continue up to find a yellow save cube and Zachary's item shop. Go up and left to the west waterfall. Defeat to the man standing to the right of the waterfall. Step on the pedalo recovery point where the man was standing to call a pedalo (the white bird that allows you traverse the red rivers). Board the pedalo and ride it up to the top of the large waterfall. On your way up, you'll see a series of boxes with two numbers inside, one white number and one black number. Note the list of numbers as you pass them. When you reach the land at the end of the red river, disembark and fight the man standing on the next pedalo recovery point. Continue right to reach the floating blocks area. Fight the man standing on the next pedalo point, but do not board the pedalo. Instead, go right again to the east end of the platform. Defeat the next man standing on the pedalo point, then use the recovery point to call the pedalo. Ride the pedalo down to the bottom of the east waterfall. Note the series of black and white numbers continue as you head down. Disembark on the island at the lower right side of the waterfall to find a treasure chest. Hop back on the pedalo to ride it left, down, and then right to find the last four numbers. Go back on land and walk to the west waterfall, then ride the pedalo up to the end of the red river. Disembark and continue right on foot to the floating blocks. Call the pedalo to ride around the floating blocks and solve the puzzle. Use the numbers you've seen around the red rivers to find the correct order of the boxes. The white number refers to the order in the sequence (white 1 is first, white 2 is second, white 3 is third etc). The black number indicates the corresponding floating box. Go all the way back down to the save cube, then go up through the unblocked door to the maze. Go right to the Judge's room to speak with him. Move back up to the main hub of the room. To escape the maze, move Left, Up, Right, Right, Down, Left, Up, Up. If you take a wrong turn, you'll be sent back to the Judge's room; simply return to the hub and start over to reach the exit. When you exit the maze, loot the treasure chest on the right and use the red cube on the left to heal or save your game, then continue up through the door to Dedan's office. Climb all the way up the stairs to find and battle Dedan. After Dedan's defeat, you will be returned to The Nothingness. From The Nothingness, move up and right then enter Zone 2. At the starting area of zone 2 is a red cube where you can save your game. From there, move up twice to the south side of the Library, then move left to the west side. Go down the bottom path of the west side to reach the shore. Talk to the man standing alone on the right. Pay him 100 Credits to receive Page 33 in your inventory. If you check this page in your inventory, it's the 8 of Hearts. Move right to return to the west side of the library, then go through the open door to enter the library. Go all the way down and through the door at the bottom to reach the reception area. Talk to the man standing behind the desk to gain access to the upper levels of the library. Climb up either stairway to reach the second floor. Around this area you can speak to the two men in the room and read some of the books in the bookcases. Most the bookcases are false, but the bookcases are indicated by a light colored section of the floor in front of it. Read the book in the left bookcase at the upper right corner of the room. Inside the book is an image of all the cardinal directions and their corresponding arrows, identical to the symbols on the walls outside of the library. Remember these symbols if you're ever confused while traveling around the Outer Area. Go up the stairs to the Third Floor. Go to the upper right room. Inspect Page 33 (the page you purchased at the Outer Area) in your objects list. Note that the pattern on the blotted page looks just like a playing card, specifically the 8 of hearts. If you read the book in the bookcase at the upper right corner of the room, you'll see the page of the book is a 7 of hearts. Insert Page 33 - 8 of Hearts from your inventory into the book. Loot the chest at the lower right corner of the same room. Move to the upper left room. Take Page 33 - Queen of Spades in the middle of the wall to the left of the blocked doorway. Go to the lower right room. Read the book in the bookcase on the left side to view the left page with an ace of spades pattern. Insert Page 33 - Queen of Spades into the book. Take Page 33 - 3 of Clubs from the wall at the upper left corner of the room. Go to the upper left room. Read the book in the bookcase at the upper right corner of the room to view the left page with a 2 of clubs pattern. Insert Page 33 - 3 of Clubs into the book. Go to the lower left room. Loot the chest in the middle of the top section of the room. Read the book in the bookcase at the lower left side of the room to view the left page with a 4 of diamonds pattern. Insert the 5 of Diamonds into the book. Go back down to the First Floor. Speak with the man at the desk to let him know that all the pages are in order. In return, he will give you access to the fourth floor. Return to the Third Floor, then continue up through the door to reach the Fourth Floor. At the middle of the stairs you can use the yellow cube to heal your party and save the game. Continue up the stairs to reach the first room. Speak with Japhet to engage him in combat. After his defeat, pick up the white circle in the middle of the room for Add-On Omega to join your party. Exit the Library to go back to the Outer Area. Speak with the judge to the right of the exit. Go left twice to reach the north side of the area (indicated by the two arrows pointing up), then go down and into the Shopping Mall. Speak with Zachary to view the item shop. There is a yellow save cube here if you wish to heal your party or save your progress. Continue through the door on the right and head down the stairs to the Second Floor. Go down, left, up, and left again to find a treasure chest. Return to the entrance, then head right twice, down, right, and down to find a second treasure chest. Go back to the entrance again and head down, left, down twice, left three times, up, and right to find the exit. Between the two flights of stairs is another yellow cube where you can heal your party or save your progress. Continue down the left stairs to the Third Floor. After you walk through the entrance door, head down, right, up twice, left twice, up, and right twice to find a room with a treasure chest containing the Monday special item inside. From the chest room, go left twice, down, and right four times. You should arrive at a doorway leading to a room with a lost man inside. From there, go right, down, left twice, and down again to find a treasure chest. Move back up, right three times, up twice, left three times, up, left twice, and up again to find another treasure chest. Now go down, right five times, up, and left to reach the exit. Speak with the Judge in the area between the stairs, then continue down the left stairs to return to the First Floor. Use the pedalo recovery point to the right of the door to call a pedalo. Go out the door to the item shop, then exit to the Outer Area. Go down to reach the north side, up to the west side, and then down again to return to the shore. If you used the pedalo recovery point at the First Floor of the shopping mall, a pedalo should be waiting for you at the water's edge. Ride the pedalo left to the open sea and continue heading left until you find a small island. Land on the island and go down the stairs to discover a treasure chest. Return to the pedalo and go right to reach the main island by the shore, then disembark and head down the stairs. Continue forward and up to the end of the hall to reach the Park. Pop the balloon in front of you to receive an item. Continue up to the park entrance. At the center of the main room is a yellow cube where you can heal your party and save your progress. Go north to the Balloon Game Room. When you enter the room, the man at the booth will challenge you to a game. Each player takes turns popping 1, 2, or 3 balloons. Whoever is left the last balloon loses. The key to winning this game is to leave only 5 balloons for your opponent, whoever has the turn when there are only 5 balloons left is guaranteed to lose. After you beat the man at the balloon game, he will attack you. Defeat him in combat to receive a Necktie. You will be automatically returned to the Main Room; continue right to the Plastic Pools. Use the pedalo recover point at the right wall to call a pedalo in the plastic river. Board the pedalo and try moving over the dark square in the middle of the water. Note how the track point carries your pedalo along a controlled path in the water. Move right to the main area of the plastic pools. Hug the wall as you move right and then up to the first island at point A. Land on the island and pop the balloon to find treasure, then board the pedalo. Continue left, down, and up, being careful to avoid as many of the track points as possible until you reach the crossroads. From here, move left and down to find the next island at point B. Pop the balloon to find the treasure, then get back on the pedalo to move up and all the way right. You will be carried just a little past the balloon at point C on the tracks. Move one space to the right, then hug the wall as you move up, right, and down to the island at point C.
Pop the balloon to find the treasure, then get back on the pedalo and hug the wall up, left, and down to return to the point you were at a moment ago. At this point it gets a little tricky; keep an eye out for the track points in the water. Position yourself at point D and move up to ride the track to the wall at the back. Move through the clear path in the water until you reach point E.
If you cross over the right track point, it will carry you only a few steps to the left. Go through the clear path in the water, being careful to avoid track points, and down to the island at point F.
Pop the balloon to find the treasure, then move all the way up to touch the back wall. Hug the wall left and down to the next crossroads, stopping at point G.
Move one space left and one space down to navigate safely around the track points in the water. Go through the clear path in the water to the island at the upper left corner at point H.
Turn the switch OFF, then ride the pedalo to the bottom wall (but not into the exit on the right!). Go through the clear path in the water to reach the last island at point I. Pop the balloon to find the final treasure, then exit by moving to the wall at the lower right corner. Land the pedalo back at the entrance, then leave the Park and return to the shore of the Outer Area. Go right to reach the west side of the library. Move up to the south side, then go up again to the east side. Go down to find the residential area entrance. Follow the path right to find a yellow cube where you can heal your party and save the game. Wear the Necktie in your inventory from the Balloon Game Room. The blockade in front of the north path will disappear. Continue up to the Residential Area. When you enter the zone, Japhet will spawn several ghosts around the town. A four minute timer will count down while you explore the town. Before you kill all the ghosts, head to the courtyard where you can find Ghosts 5 and 6, then go up the stairs and into the door on the left. Enter Room 1 and ask the man hiding in the corner for the code to the southwest bunker, 1402. Go to Vault 1 at the southwest corner of the town, just ahead of the entrance. Enter in the code 1402 to open the door and go into the vault. Attack the man who runs to the corner, then loot the treasure chest in the upper right corner. Go to the fenced area by Ghost 3 at the southeast section of the town. Talk to the panicking man to learn another vault code: 1805. Go to Vault 2 at the northwest area of town and enter in the second code. Enter the vault and loot the treasure chest at the lower right corner of the room. Defeat any remaining ghosts, and you will be returned to the entrance outside. Return to the Fourth Floor in the Library. Now that the Residential Area has been cleared, the path to the stairs at the back go the room is unblocked. Go up the stairs to the Fifth Floor. Read the book in the bookcase at the upper right corner of the room. Note the numbers at the bottom of the left and right page, 1 and 4. Continue left to the fifth floor balcony. Go right and enter the next room through the door at the end of the balcony. Read the book in the bookcase at the upper left corner. Note the numbers at the bottom of the pages again, 2 and 9. Move left to the lower left section of the room. Read the book in the bookcase below the middle wall section. Note the numbers at the bottom of the pages, 3 and 9. Go to the upper left section of the room. Read the book in the bookcase to the right of the door. Note the numbers at the bottom of the pages, 4 and 7. Move to the upper right section of the room. Read the book in the bookcase at the top right corner. Note the numbers at the bottom of the pages, 5 and 1. Exit through the door near the upper left section of the room. Go up the stairs to the landing between the two stairways. Read the book in the right bookcase. Note the numbers at the bottom of the pages, 6 and 6. Continue up the stairs to the Sixth Floor. Again, go up the stairs to the landing. Read the book in the left bookcase this time. Note the numbers at the bottom of the pages, 7 and 4. Exit through the door on the right to the sixth floor balcony. Go through the large door on the left to enter the floating blocks room. Read the last book in the bookcase at the upper left corner of the room. Note the numbers at the bottom of the pages, 8 and 0. Hit the floating boxes in the correct order, using the clues from the eight books you've read. The number on the left page refers to the sequence of the numbers (1 is first, 2 is second, 3 is third, etc.). The number on the right page indicates which of the blocks should be hit. Just like before, imagine the blocks are organized like the numbers on a key pad. 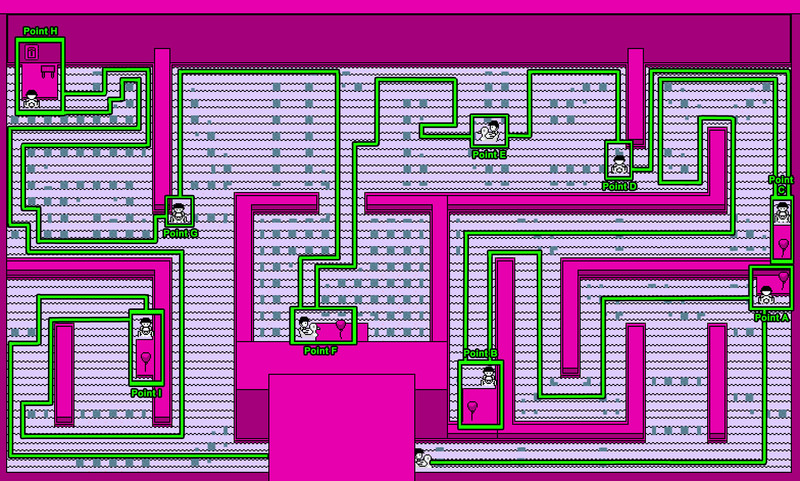 After the puzzle is solved, exit through the unblocked door at the top of the room. Continue up the stairs to the balcony of the Tower. Use the red save cube at the upper left corner to heal your party and save your progress. Speak with Zachary on the opposite end of the balcony to view the item shop. Climb up the ladder to the top of the tower to start the boss encounter with Japhet. After Japhet's defeat, you will be returned to The Nothingness. Go down and press enter to travel to Zone 3. Head up and enter through the door to the entrance of the factory. Take the Stamped Note on the left side of the wall. Go through the door on the left, then continue left to A-1. You can use the Stamped Note in this room by pressing the shift key. Pay attention to the series of numbers and their colors. The key to traveling around this room is to move between the blocks in the correct order and the correct color. If you make a misstep, you will be ambushed by a group of enemies and teleported back to the entrance. Refer to the map below for a visual guide to safely travel around the room. Take the white path first to the door at the upper left corner of the room. Start by moving left to the black 1 square. Continue left and stop at the white 1 square. Move up to the white 2 square. Go left to the white 3 square. Continue down between the two left tables to the white 4 square. Go down to the right side of the crates at the white 5 square. Move left to the left side of the crates at the white 6 square. Travel all the way up to the corner of the upper left table at the white 7 square. Go left to the wall and up to the white 8 square. Move up the wall again and then right to the white 9 square. Enter through the doorway directly above you to reach the West Dorms. Walk down the end of the hall to start the cut scene. After they kill the man, defeat the group of enemy spectres. Move two rooms down to find a treasure chest. Exit the dormitory to return to the start of the A-1 area (you can retrace your steps, or simply walk out of line for a quick battle to teleport you back to the start). This time take the black path the door at the upper right corner of the room. Just like before, stick to the correct path between the tiles, or you will be ambushed and teleported out. Move left to the black 1 square. Continue up to the black 2 square, just under the standing man. Go left to the black 3 square below the far right table. Move left and up around the corner of the table to the black 4 square. Continue up to the black 5 square above the third chair. Go right to the black 6 square beside the right wall. Move up to the black 7 square below the right window. Go left to the black 8 square, then go left and up through the doorway into the Kitchen. Speak with Zachary, who is standing in the corner of the room. Zachary will tell you your next destination, the East Dorms, and ask you to take the monorail to the Treatment Rooms of Area 2. Exit the room, then retrace your steps to the black 5 square. Continue left to the brown 6 square. Move left and up to the brown 7 square. Go left and down to the brown 8 square. Move left to the brown 9 square. Continue up to the brown 0 square, then go through the open door to the East Dorms. Move up to the end of the hall. Pick up the Add-On Epsilon to add it to your party. Go right into the last room to find a treasure chest. Exit the room and return to the Entrance, then continue through the right door to the monorail. Enter the monorail and take it to Area 2. Exit the monorail and go up the stairs to the outer area. Speak with Zachary to receive a free item. If you enter the right building, you can find a yellow save cube and Zachary still in character as the Judge. If you enter the middle building to see Zachary as himself and view the item shop. Enter the left building to reach Treatment Room 1. Go to the three switches on the right side of the room. Flip all three switches so that they are in the OFF position, which will unblock the single switch. Go to the single switch on the left side of the room. Turn that switch OFF as well. Return to the three switches on the right side of the room. Turn ON the right switch under the letter C to open access to Room 2. First flip the switch at the top right corner of the room. Next, go to the switch at the top left corner of the room. Turn the switch OFF to gain access to the treasure chest by the crates at the lower left corner of the room. This switch also blocks or unblocks the exit door leading to Room 1. Return to the switch at the upper right corner to activate it again, which will put 4 blocks in front of the top door. Go to the switch in the middle of the room. Hit the switch to unblock the path to the exit. If you try to go through the door, the security test will ask for a passname. Put in any incorrect answer to receive a clue, "Director's note: Pay attention to thugs". Note that the silhouette in the clue looks identical to the enemies you've been fighting around the room. Wander around the room until you engage in combat with one of the "thugs". Use The Batter's "Wide Angle" competence ability while in combat to identify the mob's name. Go back to the top exit door and enter the name into the security code. Go up into the Sugar Vault. After the cut scene upon entering the room, the three workers will attack you. Defeat them in combat to clear the room, and Zachary will enter to direct you to Area 3. Before leaving, loot the treasure chest in the lower right corner of the room. Fight your way out of the treatment plant to the Outer Area, then return to the monorail and ride it to Area 3. Leave the room and go up the stairs to the outer area of the factory. Climb the ladder all the way up to the top of the tower. Jump down into the hole to start the mini-game: Game of the Mortal Fall. "Catch ten Add-Ons before the timer runs out so the Batter won't crash with a bloody noise. Be careful about the phantoms! If you touch three of them, you lose. Press Enter to begin!" Use the arrow keys to move around the pipe and collect 10 white rings, while avoiding phantoms. You must be in the center of the ring before it expands to collect it. The Add-On counter at the upper left corner will track your progress, as well as your health points. If you can make it safely to the bottom, you will land at the Furnace. Go down the stairs into the sugar oven room. Speak with the man in front of the oven, then return upstairs. Jump into the hole in the wall to travel to the subway. Approach the monorail to speak with Zachary. Enter the monorail and select Area 4. When the vehicle tops, exit through the door to go out onto the tracks. Talk to the man blocking the train to engage him in combat. After he is defeated, return inside the monorail and talk to Zachary again to travel to Area 4. Leave the room through the south door to reach the first room of Area 4. You can save your progress and heal your party at the yellow cube, then head right to the East Area of the halls. Move right to the second door, then open the door to go inside the Treasure Room. Defeat the man inside the room, then loot the treasure chest to find a Music Box. Leave the room and continue all the way to the right and then all the way down to find a second treasure chest. Walk all the way up to the end of the hall to find the Shop. Enter the room and speak with Zachary to view the item shop. Return to the save cube at the Entrance, then continue left to the West Area. Go left past the first two doors, then open the third door to enter Room 2. Move to the right side of the desk and push it through the wall. Exit the room, then go left and open the fourth door to enter Room 1. Read the paper on the desk to view an "important clue". Note that there are four X's and beside each X is a character's name with the first letter highlighted in red. The top X is Zacharie, the right X is The Batter, the bottom X is The Director, and the left X is The Judge. Exit Room 2, then go right and down the hallway. Avoid or defeat the man patrolling the hall, then open the first door on the left to reach the Stairs. Go down all the flights of stairs to find Zachary in character as the Judge. Do not give him your Music Box in exchange for the clue; instead, I will give it to you for free! "In the game folder, your browser will find the file 'Read me'. Its name is not innocent, I'd suggest an active, assiduous reading." Leave the room and go three doors left. Open the door to enter the Friday Room. Approach the blank space at the top of the room to hit an invisible wall. Press enter or spacebar to open the invisible chest and receive the Friday card, an equipable Special item. Return to the save cube at the Entrance, then continue right to the East Area. Go up to the top of the hallway. Open the door to enter the Password Room. Walk to the left side of the room and inspect the game controller on the table. Open the READ ME.txt in the game's folder. Scroll down to the 5th question of the FAQ to find the secret code: Down - Left - Up - Right - Z - J - B - D - B - Start. 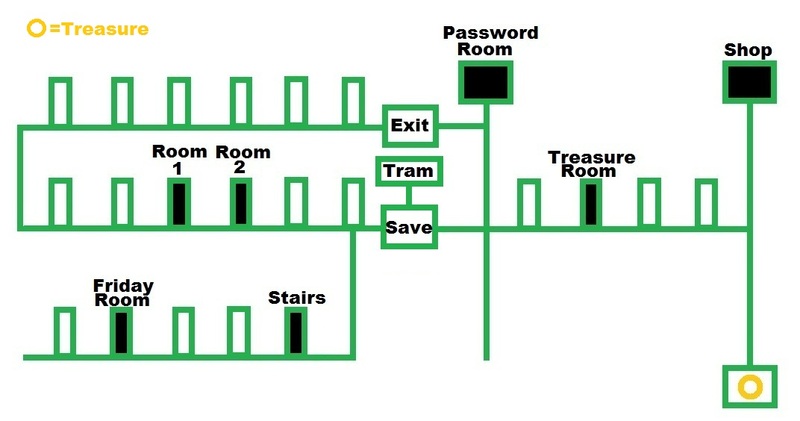 Use the note from Room 1 to determine which of the four green buttons are Z, J, B, and D.
If the code is entered correctly, you will gain access to the lower levels. Exit the room and go left to the next area, then head down the now-unblocked stairs to the Enoch's Floor. Head right to the end of the hallway and into the floating blocks room. Read the combination of numbers written on the wall and hit the boxes in the correct order to open the doorway. This twist to this puzzle is that the floating blocks are now arranged upside down. With that in mind, enter in the combination: 5-3-6-2-5-8-C.
Go through the open door to the next room. Use the red cube in this room to save the game and heal your party if necessary. Continue forward, then navigate to the end of the two platforms to reach the Enoch's room. When you approach the Enoch for the first encounter, he will be at full power and impossible to defeat. Select "Attack" and wait for The Batter's turn, then choose to Flee. Attempts to flee may fail at first, but repeat it and eventually you will escape outside the room. After you take a step, the Enoch will appear and chase after you. Run down to the bottom of the platform, taking as few turns as possible to maintain your distance. If he catches you before you can escape, simply Flee from him in battle and run away again. Return through the purified halls to the monorail station for the final encounter with Enoch. To get there, go left and up the stairs, then go left again and all the way around the white halls to the exit door on the right; exit through the door at the top of the stairs to reach the monorail. After the boss is defeated, you will be returned to The Nothingness. While you now have access to The Room, you can also travel to the four purified Zones. At the start of the purified zone is a red save cube where you can heal your party, save your progress, or return to the Nothingness. Enemies in the purified areas are much stronger, so be sure to save and heal often. The layout of purified zones is also often changed, so exploring familiar areas may lead to new results. Go up to reach the train tracks, then follow the tracks left to find a treasure chest. Follow the tracks back to the middle and continue right to the next station. Go down and right to find the stairs leading into the underground mines. Continue right and up to find a yellow save cube and a treasure chest. Go down and left to find a treasure chest. Walk up and right, then up and right again to find a second treasure chest. Go all the way down to the bottom of the long vertical hall, then all the way left to find a treasure chest in the hidden room. Go right, up, and right again to reach the exit to the surface of the Barns. Push the stones out of the way at the entrance. Move the stones at the top of the right path to find a treasure chest. Go to the fenced off building at the left and move away the stones to reach the entrance. Push the lower right stone two times to the left. Push the upper right stone up once. Push the upper left stone left once. Go through the open door into the room to find a red save cube. Exit through the door at the top of the room, then move away the stones to get back to the path. Take the road up to station, then follow the tracks right to the Postal Service Building. Go down and left to find the entrance to the building. Walk to the back of the room to find a treasure chest. Return to the station and follow the tracks right to Alma Station. Enter the building via the door on the right. Exit through the back door and follow the road up to find a yellow save cube and a treasure chest. Move right to the east waterfall to find a pedalo station and use it to call for a pedalo. Go back to the middle area, then continue left to board the pedalo at the end of the platform. Ride the pedalo left and up the west waterfall. When you reach the top of the waterfall, go right until you find a building between two small waterfalls. Land the pedalo and go through the open door to discover a red save cube and two treasure chests. In the right treasure chest is The Grand Finale, the element of Plastic. Use the red cube to return to The Nothingness and travel to the Purified Zone 2. Follow the path up to the south side of the library building, then continue left to the west side. Go down to reach the shore, then walk left and down the stairs. Travel through the tunnel and around the fenced area to find a treasure chest. Return to the south side of the library and move through the door to go inside. Climb the stairs all the way to the very top floor to find another treasure chest. You can walk back down to the south entrance of the library, or use the red save cube to teleport to the start of the zone and walk back from there. From the south entrance, go into the library and take the door to the left into the hall. Walk down to the end of the hall, then exit through the door in the middle of the back wall to reach the shopping mall at the north side of the building. In the first room of the shop is a yellow cube where you can heal your party or save your progress. Go through the door on the right, then continue through the next door on the left into the cat room. Loot the chest in the middle of the room then go back down the stairs on the left. Continue through the right door to enter the maze. Right, down, left twice, up, left twice, up. Down, right twice, down, right twice, up, right, down twice, right, down, left twice, up. Finally, take Path 3 all the way to the exit. Down, right twice, up, left, up twice, right, down, right, down three times, left twice, down, left, up, left three times, down, and right. Go through the door to exit to the hall. There is a yellow cube here where you can heal your party or save your progress. Go down the hall and up the stairs into the vault. Exit through the door at the bottom of the room to reach the Residential Area. From the entrance at the northwest vault, go right and continue down two flights of stairs. Follow the left wall just above the third flight of stairs to find the open door to another room. Enter the room and note the four digit number written on the wall: 1709. Down, left, down, right, down, right, and up. You should stop at an open door in the middle of the southern part of town. Enter the room and go out the door to the left, then climb up the ladder onto the roof to find a treasure chest. Go back out to the street and move right to reach the vault in the southeast part of town. Use the code 1709 to open the vault door and go inside. Go down the stairs to find a red cube and two treasure chests. Open the right treasure chest to find The Grand Diagonal, the element of Metal (2/5). Use the red cube to travel back to The Nothingness and into the Purified Zone 3. Go up into the building and through the left door into Area 1. Enter the right door at the back of the room to find a treasure chest. Go back out and move left to the door at the upper left corner of the room. Enter the room and walk through the door at the back of the room to Area 2. Move up, right, and then down to enter the monorail station. Go down the stairs and through the right door to find a treasure chest. Exit the building and go through the open door on the left into the first treatment room. Move through the door in the upper right corner to reach the second treatment room. Next, go through the door at the top left corner to enter the sugar room. Loot the treasure chest in the upper right corner. Exit through the door at the middle of the back wall. Go up and right to Area 3. Go up and right to the base of the tower. Climb the ladder all the way to the top, then jump down the hole into the furnace. After you land at the bottom, jump through another hole in the middle of the wall. This time, you will land by a red save cube at a monorail station. Enter the monorail and travel to the only destination, "???". When you arrive at the next station, leave the room to enter Area 4. Go left to the west halls area. Move down and then left to the very end of the hall to find a treasure chest. Return to the entrance to the west hall, then go left, up, and right all the way to the second-to-last door. Open the door to find a treasure chest. Go right to the upper room between the two halls, then go down the stairs. Continue right down the end of the hall to the room with a yellow save cube. Exit through the door at the lower right to enter The White Room. The White room is a big open area that infinitely loops around unless you move in the right direction. Starting at the door, head to the lower right corner of the room in a diagonal line. Eventually, you will come to another small room with a closed door. Go inside the room to find a red save cube and two treasure chests. Open the right chest to find The Grand Spectral, the element of Smoke (3/5). Use the red cube to return to The Nothingness, then travel to the Purified Zone 0. Walk up and through the open door into the middle building (with the numbers written on the wall). Go down the stairs in the middle of the floor, then through the door at the end of the hall to enter the sugar room. When you enter the room you will begin the encounter with Sugar, a very powerful boss. After she is defeated, you will receive The Grand Chocolatier, the Sugar element (4/5). Exit the building and go into the right room to find Zachary's item shop. Continue through the door at the back of the room and up to the red save cube. Return to The Nothingness, then enter The Room. Walk up and through the door at the end of the hall into the main room. Go through the door on the left into the bedroom. Inspect the calendar pages on the back wall. Exit the room, then go through the door at the lower right to be teleported back into the bedroom. This time, read the note on the back wall, then exit the room to be transported back to the red cube at the starting area. Go up to the hallway to attack the incoming horde of teddy bears. After they're defeated, continue up to the main room, then re-enter the bedroom. Exit through the new door at the back of the room to enter the drawn hallway. The hallway is just an endless loop, so you can simply go back through the exit to teleport back to the red cube at the starting area. Exit through the north door to end the chapter. Go up the hallway into the main room, then through the left door into the bedroom. Exit out the door at the back of the bedroom. Walk through the door at the end of the hallway to view the drawn map. Move the arrow over the west red circle to travel to the Tall Mister. Go through the open door to enter the cabin. Speak with Dedan, and he'll ask you find the date for him. Leave the area to return to the drawn map. Move the arrow over the east red circle to travel to the Big Mister. Talk to Enoch, stuck in the hole. He'll ask you to find someone who can help pull him out. Move the arrow over the north red circle to travel to The Room. Go down the hall and into the bedroom. Take the calendar sheet from the wall. Exit the bedroom through the top door, then go up the hall to return to the drawn map. Move the arrow over the west red circle to return to the Tall Mister. Show the calendar page from the bedroom to Dedan. In return, he'll give you a book with an unreadable cover. Leave the cabin and go down the road at the bottom to return to the drawn map. Move the arrow over the north red circle to travel to The Bird. Walk to the end of the cliff and speak with Japhet. Give Japhet the book from Dedan, and in exchange he'll agree to help you. Go down to return to the drawn map. After speaking with the characters, leave the area to return to the drawn map. Move the arrow over the sun in the upper right corner. Travel to "Mama" to end the chapter. At the start of the chapter, you will be presented with a false menu screen. Hit Continue to "load" the first save block at the top to travel to Block 1. Walk up the hall into the main room. Avoid the red spots on the ground that will damage your team. Go into the bedroom through the large door in the middle. If you didn't already give it to Zachary, use the Music Box from your inventory in this room to reveal a hidden treasure chest. Open the chest to find a Perfect Symbol. Exit to the main room, then continue through the next door on the bottom left. Move to the center of the platform to talk to the giant. Four large numbers (8946) will appear in the middle of the screen: simply repeat them to the giant when he asks for a "random number". Enter the next room through the door on the right. At the top of the room is a ball in the upper left corner, a series of crates, and a hole at the bottom of the rectangle. In the middle of the room are nine cross symbols. When you walk on top of the cross symbols, the ball will follow the direction of your movement. Walking up will move the box up, walking right will move the ball right, etc. The ball will stop if it hits a barrier like a crate or one of the walls of the rectangle. Use your movements on the crosses to direct the ball into the hole. Move down, right three times, up, right twice, down three times, and then left. After the ball lands in the hole, note the four numbers along the back wall, 3755. Go back to the main room and then out through the door at the upper right corner. In the following rooms, you will be asked a series of questions that you will have only one chance to answer correctly (go back to the red save cube at the start just in case!). Talk to the man in the room for the first question. Question 1: What day is it today? If you answer correctly, you will receive a Mysterious Symbol. Continue out the left door then into the next room on the left. Talk to the man for the second question. Question 2: Which station can I find metal in the stomach of cattle at? If you answer correctly, will receive an Aura of Power. Leave the room then continue up and to the next room on the right. Talk to the man for the third question. Question 3: Which of these books cannot be read at the library? If you answer correctly, you will receive The Eighth Colour. Exit the room and continue up to the end of the hall. In the middle of the back wall are two leaves inside a circle pointing to the right and an object in between them. Inspect the object on the wall to view the design on the back of a playing card. Note the rows of leaves inside the circles identical to the ones on the wall. Remember the positions of the leaves that point to the right in each row. Go left to enter the next room. Talk to the man in the center of the room for the final question. Question 4: Can you give me the secret code to the warehouse? If you answer correctly, you will receive a Bleeding Symbol. Go all the way back to the save point at the start of the level. Exit back through the door to view the false menu screen again, then load Block 2. Go down the hall of shadowy men into the main room, then continue up through the door at the top right corner. On the left side of this room are rows of floor tiles identical to the card pattern and the leaf symbols seen back at the Load Slot 1 area. Push the buttons on the floor that are in the same position as the right-pointing leaves on the back of the card. You must be standing directly on top of the button you want to push down. If you make a mistake, simply exit and then re-enter the room to reset the tiles. If the buttons are pushed correctly, a hidden number will appear on the middle wall. Return to the save room, then exit back through the door to return to Block 1. Go back to the main room and through the lower left door to return to the giant. If you give him the correct code, you will receive the Sagittarius Card. Return to the save room, then exit back through the door to view the false main menu and load Block 3. Continue through the door at the upper right corner. Hit the blocks in the order of the numbers found after solving the rolling ball puzzle at Block 1. Exit the room and go all the way down the hall to return to the save zone. Go back up through the door to end the chapter. Go up the hall and into the main room. Enter the bedroom through the large door to the left. Read the comic book lying in the middle of the floor to start the minigame. Follow the road to the right three times. Use the arrow keys to direct Boxxer and avoid the incoming Ballman clones. Boxxer will go into combat with any clone that runs into him. When you reach the end, the final battle with the clone army will begin. Use the Boxx Bomb competence ability to wipe out all the enemies simultaneously. Exit the room to return to the final save point (this is the last time you can save in the game!). Speak with Zachary and view the items from his shop. Purchase the Grand Brachial, the Meat element (5/5), at the bottom of the list. Use the red cube to return to The Nothingness, then travel to Zone 0. Go up and into the right building. Speak with Zachary if you've collected all five secret elements. Accept his offer for a rare object and choose between two items: the Ashley Bat (the strongest weapon for the Batter) the Aries Card (which allows you to view the 3rd ending). Make your choice, then go up to the red save cube and travel to The Nothingness. Teleport to The Room, then exit through the door at the top to reach Chapter 1. Go up the hall and exit through the door at the end. Continue up the stairs to the Queen's platform to start the boss encounter. After her defeat, exit the room to end the chapter. Go down the hall into the main room. Enter the bedroom through the door to the left. Approach the child to start the boss encounter. After the child is defeated, the room will be cleared. Exit through the door at the top, then continue up the hallway. When you reach the room at the end of the hall, you will be approached by The Judge. 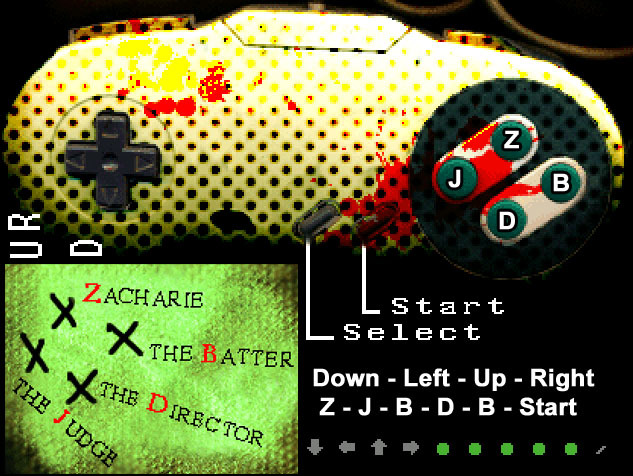 At this point, you will have a choice between two endings: The Batter Official Ending or The Judge Special Ending. Make your choice to start the final battle. Surreal games are my absolute favorite, but the screen flickers black every few seconds and it's driving me insane. I take it that it isn't intentional? Hi Calistus! No, not intentional. Have you tried running the game windowed? ALT+ENTER at the same time should do the trick. I hope it helps. Can someone tell me how to get out of the building in zone 1? I'd be happy to help, but which building are you referring to? There are several buildings in Zone 1. The cat on the roof can give you some help. He will direct you to the ground floor, where some of the people will have the code for the right floor to go to. Otherwise, I think this game is pretty cool, but I literally have no idea how the floating block puzzles work. I've just hamfisted my way through every one after the first. What am I missing? Ah, okay! First thing you should do is travel to the roof (on Floor 99999) and talk with the Judge. He'll give you a hint of how to find the Postal Service room. If you're still stumped, go to the ground floor (00001) and talk to the men in the rooms. They'll all name off different "Form" and "stamp" numbers. In only one of those four rooms do the men all say the same stamp and number. It's the men in the lower left room: They all say "Form 2584, stamp 10258." These numbers are both floors you can travel to with the elevator. Go to Floor 02584 to find a treasure chest, then go to the Postal Service room on floor 10258. There are a few different variations on the floating blocks puzzles, but they all follow the same concept: each square represents a certain number (usually read from left to right, then top to bottom) and must be pushed in the right order. 1, 2, 5, 9, C.
In this case, that would mean hitting the left box on the top row (1), the middle box in the top row (2), the middle box in the middle row (5), and the right box in the bottom row (9) and the lone box at the bottom (C). If done correctly, the boxes will become translucent and start to move. Voila! Thanks Dora, that fixed it! Loving the feel of this game. Memories of Yume Nikki. The "bizarre" things? I one for each element. Except Sugar. Weak pointers for where to go for your next spoonful of quest doesn't help, as it means more random encounters for the computer to play, and increasing frustration. This all detracts from any kind of pacing or atmosphere as you wander around in the dratted dark wondering if you missed the chamber with the plot in it, losing all interest in the cutscene which gave you the last snippet of plot two hours of wandering around in the dark ago. ...Buggy fullscreen doesn't help either. I loved this game... up until the end. My favorite part was the absurdity of a place like that really existing, explanation-free. They breathe the smoke? Alright! They farm the cows primarily to get at the rocks inside them? Well, sure. Meat fountains accompanied by pictures of swimmers? Makes sense in context, sort of! Creepy girl in the basement who loves sugar, talks in emoticons, and just wants to dance- and given the Batter's unreliability as a narrator, could be attacking you out of nowhere or just defending herself from you? And who, afterward, gets a cryptic comment from her "friend" about how it's probably better that she's dead? This is wonderfully unsettling stuff. And the Batter's behavior in this bizzare-but-still-just-is-what-it-is world is even creepier. No matter what happens, he just wants to destroy the ghosts. He has no interest whatsoever in anything else, including actually helping people. I went right back to Zone 1 after "purifying" it, and it was certainly chilling but it also fit perfectly with what had been established about the Batter so far, and the creepy vibes about purity and such. I even enjoyed seeing it all come together, how the different zones coexist. But the stuff in The Room took me out of the experience. Adding a personal connection to the Batter (and something of an explanation for the world- more on that later) took away the thing that made this game most unsettling for me. The Batter taking apart a world to "purify" it, even though that means killing a lot of people who don't deserve it or something very similar to that. It already crossed a lot of lines as it was, and having it be about his wife and child changed completely what it was and it wasn't as fun for me anymore. Finally understanding what the "off" in the title referred to was awesomely chilling, though- especially because it wasn't out of nowhere, but again, something that completely made sense. I still liked it, though- I just loved it before, so it was a little disappointing to see it become... what it became. Not worse, just not what I signed up for. but is it just me, or is this about a father making some bad decisions about his dying child's happiness in order to prevent said child's suffering, culminating with a choice on whether or not to pull the plug? but it's just a joke ending about monkeys, and doesn't add any more to the story. Zone 0. In the middle room on the ground level (the one that looks somewhat like an elevator, and has numbers on the wall, there's now a staircase going down, and you can fight a bonus boss. Defeating her gets the Sugar. She's tougher than anything else you'll have to fight in the game. I was level 18 when I took her on, and I still needed a ton of healing items to do it. Stock up and level up. The Room when you need to read the map? For some reason whenever I try to, the game crashes. You continue without looking at the papers on the wall. Simply enter the bedroom and walk back out (if it works, the chairs should be rearranged into the shape of a smiley face when you come out). I tried, no luck. The place just keeps looping back into the room when I try to go back into the hallway. So I beat this game about two days ago and haven't been able to stop thinking about it... After scouring Google I've not found a place discussing the ending or interpretations of the game. I have WAY more questions than answers! Does anyone have any insight as to what the final events of the game mean in context with the rest of the game? (Sorry, trying hard not to include spoilers). I think hyena is onto something regarding their interpretation of the title and ending... If anyone wants to discuss this via PM I'm more than happy to oblige! You're more than welcome to share any information, discuss interpretations, or spoilers here! Just make sure to keep those comments inside a spoiler tag, instructions are right above the comment box and remember to use the preview button. For instance, I thought it was interesting how the father (The Batter) became the physical manifestation of the villain (The Ballman) from the comic book he purchased for his child, Panic in Ballville. Also, at one point in The Room when you read snippets of the child's diary, it says something along the lines of "Father says I can play outside tomorrow". I wonder if the connection between athleticism and "evil" is tied to a father's disappointment in the inability for his ill child to go outside and play things like baseball. Certainly, there is a link between the Ballman's desire to destroy the Boxxer's world and the actual Batter destroying his child's world. Speaking of disappointment and physical manifestations, how crazy was it that Dedan, Enoch, and Japhet were all representations of the Add-Ons? It was almost tragic how they were each symbolic of happiness, friendship, material possession, etc. I wonder if they were the false promises of a wishful father? Their ties to him would also explain why the Add-Ons became companions of The Batter, much to the Judge's confusion. It's especially tragic that even after destroying those thoughts (by destroying the three bosses), he has to carry them with him. The overall message is really the saddest, though. The key moment I realized that the ending was about the father pulling the plug on the child (and the significance of the title "OFF") was during the battle in the bedroom. When you see your victory over the child consists of nothing more than striking out against him while he sits there defenseless and motionless, it hits home that you've "purified" a damaged world by destroying it. I think that's why the Judge is my favorite ending. From what I could tell, the Judge is likely the father's conscience. When he defeats the Batter at the end and wanders the empty world alone, you at least know that the father has to live with the weight of his decision, rather than eliminating all those thoughts completely. I also noticed the connection between the main character "The Batter" and the Ballman from the comic book. This, combined with the general silliness of the zones you go through, made me wonder if the game was actually seen through the eyes of the child. I wondered if the three guardians were either people the child once met and gave fascinating storylines to, or if they were imaginary friends from the very start. This, as well as the hints that the child is being neglected (always wishing for his mother who is rarely there), make me wonder if the father has crushed his child's imagination in some way (which may be the only thing keeping the child a child... he's much too young to face the severity of his disease, whatever that may be). Because of this, the father must bear the regret of destroying his child's imagination and contrived friends (which may be his only actual friends), and that's why he has to carry the three Add-Ons around, as a constant reminder of the Batter robbing the child of his youth. There is a point before you fight Dedan in Zone 1 where he is fighting the same specters you are, and he turns to you and accuses you of being the source of the specters... I've had a hard time connecting this. Obviously you are a bad guy, but how can your mere presence cause these ghosts to appear? Regardless, it seems that at one point your cause is a noble and good one, and at some point the Batter loses the ability to discern good from bad. This is hinted during the fight with Dedan, but the fight on the monorail in Zone 3 really seemed like the point of no return for the Batter. I'm talking about the fight with the Burnt man who only cries for help, and never fights back. The Batter coldly exits the monorail, kills the man just for being in the way, and then re-enters the monorail without saying another word to Zachary... That was a very chilling moment for me. 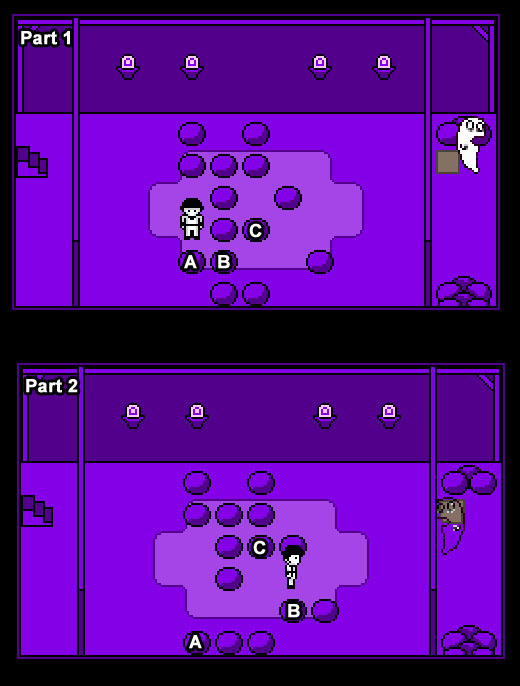 Ultimately I'm left wondering if the setting of the first three zones is the same as the setting of The Room, or whether they are symbolic or at least an altered perception by the Batter. Rocks come from cows? Meat collects in rivers and sugar is made from the bones and bodies of the dead? That sounds very much like the simple but fantastic explanation a child would come up, especially if his father isn't around to answer his questions. I also wondered if the representation of smoke coming in bottles and being breathed by the Elsens came from the child observing an adult smoking a cigarette: He would naturally believe that the adult who was smoking was doing so for a healthy reason. I feel like I'm reading into this WAY too much but I can't help but bat these ideas around (pun intended). Also, am I the only one who tried like hell to find an alternative to fighting the child? I tried fleeing and healing the child, literally anything but attacking him... there were some real moral conflicts towards the end of the game. Well, needless to say I LOVED this game. The soundtrack, the setting, the plot, the characters, everything about it was so refreshingly absurd that it really stood out to me. And the ending... wow. I can't speak for others but I would love to hear anyone else's interpretation of the game, real thought-provoking stuff! I hope everyone enjoys it as much as I did :) Take Care! I am so glad somebody else had that same interpretation of the Judge, Trinn! I'm also wondering if the Batter himself is also just one part of the father's character, not the father in general. The Judge doesn't appeal to the Batter, or even ever acknowledge him as a human being- he always talks to the player instead. Because of that I'm interpreting the Batter as just the part of the father that's committed to "purifying the world", whatever that means, and the player as the rational, decision-making aspect of the father. He's telling you to carry this out, but you're the one actually making him do it- and at the very end, you're the one deciding whether the father follows his conscience or carries his goal through to the very end. This would make sense of how Hugo sees this aspect of the father as comic book villain caliber evil, but doesn't appear to have a wholly negative opinion of his father in general. As for the zones and the bosses, I took it a little bit differently myself, though I'm probably reaching. First, it's really interesting how before a zone is purified, the monsters tend to be cartoonish, and kind of like the things a child would be afraid of. Giant whale, anyone? Then, after a zone is purified, they're creepy dead-looking children in a slightly different art style. They're also much more challenging to fight than the specters, even though it's now supposedly a purified, specter-free zone. Makes me think the normal zones are connected to Hugo's personal demons and the purified zones are connected to the father's. Plus, the way the Batter single-mindedly obsesses about ghosts and the way he talks to the Queen about Hugo's fear is oddly similar, so I'm reading the ghosts as a direct metaphor for Hugo's suffering. Probably obvious, but I just wanted to put that out there. I got a huge body horror vibe from Zone 1. Breathing in smoke to live? 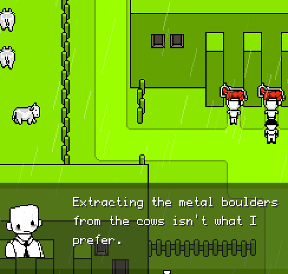 Cutting cows in half to fish out the metal inside of them (while the cows may or may not be alive- am I the only one that saw that half-cow sprite still wiggling)? Meat fountains? And more than that, it's just so useless. People don't appear to need bottles of smoke to breathe, since they're breathing normally as is. If they have to make the ocean of plastic to give people boundaries (which don't seem necessary), then why do they need to extract the boulders from the cattle to give people a place to walk so they don't drown? Why bother with either? It doesn't seem like any of this is helping anyone, just creating things for people to do, and that the goal might be keeping Zone 1 in production more than it might be to really accomplish anything. The only thing that seems at all useful is the meat fountains. I'm wondering if there might be something of a medical subtext here. The process of harvesting the metal from the cows made me think about tumors- could this be someone's interpretation of repeated surgeries to remove something? On the same line, the smoke could be some kind of medicine taken through a breathing mask, and the "ocean of plastic" might have something to do with Hugo being surrounded by tubes and medical equipment to manage his condition. The boss, with his coat and mouth, even resembles a distorted doctor- and when you go to fight him, there's a slightly diagnostic vibe to his insults. And the difference between Dedan as met by the Batter in Zone 1 (corrupt, cruel, working on the orders of the Queen) and Dedan as met by Hugo (I think?) in The Room (genuinely altruistic) is interesting along those lines, too. Might the father have seen certain really invasive, painful medical treatments as nothing but a way to delay the inevitable while the doctors profit? Might Hugo at the same time have wanted them to fight for his survival, confident that they were people who really believed in helping people and saving lives? Looking back at the cows, the way the workers treat them is really disturbing in that context. They talk about how it's better not to get attached. They talk about they'd rather be doing something else and they want to get promoted- like this is just any other job and they aren't cutting animals in half just to take unnecessary boulders out of their bodies while they might be still alive. It's (hopefully) not how real doctors see their patients, but after so much of that and so little progress, it's reasonable that the father might start to see the doctors in that light. If that's what's going on, then purifying that zone might mean calling off those treatments. I have thoughts about the other zones too, but I'm still trying to figure out how to put them into words. the Queen? Specifically, what's going on between the mother and the father, and do you think he literally killed her? The fact that he's also trying to purify the specters suggests that he's also motivated by good intentions, definitely. Thank you for mentioning that, Josh, it's part of this for sure. I'd say that his accusation that you're behind the specters supports the idea that they're Hugo's suffering- a third party might come to the conclusion that an overbearing, overprotective father might be actually harming his child by trying to protect him. Could go along with the doctor theory, if the real Dedan is Hugo's doctor(s) and the father wants to cease treatment, but even apart from that it remains an important detail. Where can we find the original French version? Please note that the original version may have bugs or errors that are fixed in the translated version. I just finished this. I would say almost a great game, but the random enemy encounters really dragged it down in some areas. I'm not sure what else the creators could have done to improve the gameplay, if you have fewer enemy encounters the game becomes a breeze, more would require a different structure. However the mystery of the game with the atmosphere is very well done. It reminds me a bit of Prometheus (film) where the lack of answers frustrates at first, but after you think about it, it really makes it better. There are some really good theories here. How do you guys think Valerie, the Judge's brother, fits in? I was thinking he may represent the father's hope for his son's recovery, hence why the Judge goes absentee and mourns for a while on the rooftop of the purified Zone 2. If that's the case, though, then what does Japhet possessing him have to do with anything? I can see how if you imagine Japhet as anger/grief or truth, and that it is masked by denial or false hope. When that realization hits him, though, the Judge (his conscience) becomes compromised and can't function or help anymore. I might be wrong in this respect, but I know Valerie (even though we barely saw him) means /something/. 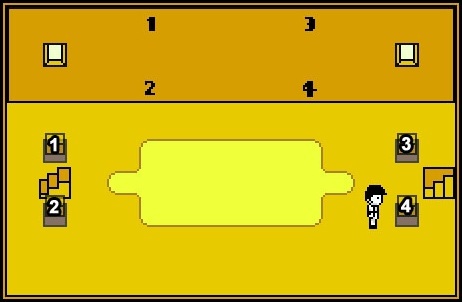 The different zones may represent different stages in Hugo's treatment, or at least just the father's reaction to stages of his son's illness. I am literally not getting the option to flee after being prompted to in the battle against Enoch. Is this some sort of bug? It never un-grays for me. And then after the second dialogue telling me to flee, there's no other prompts, so I don't know how to get the flee option to work? Can someone tell me more about the five secret elements? A little hint. I guess it was explained in the fighting tutorial, but most of the people (including me :p) forgot it. A little extra tip: while you're in the Postal Service office, go to the floor 87666 for a nice surprise! I've finished it now. It's one of the most unsettling games I've played (I think it earned that tag). I liked the interpretations very much. I must admit I noticed that something bad is happening when I finished Zone 1. I went back there to see if it changed, and found an empty, too quiet and scary place. But only at the end of Zone 3 I realised that the "Purifier" isn't really purifing of good. And the end, killing the queen, and the helpless boy, I almos cried. The only thing I could do was to kill myself. And last question: what the hell means the "true ending" of the game (if you take the Aries card)? It's just nonsense to me. After thinking about what someone said regarding The Judge being symbolic of the father's conscience, I've begun wondering whether the Batter, the Player, and the Judge were intended to represent the id, ego, and superego respectively? "Pablo" could be the name of the father's original persona, and the Batter's appearance would then be directly influenced by the evil Ballman in the comic he gave to his son. No idea where the Judge's appearance comes into play though. :P Maybe Mortis just really likes cats. are you supposed to be forced to walk everywhere? The Batter doesn't automatically run for me anymore, he just walks at a slow crawl, and since there's the chase part with Enoch it's kind of impossible for me to run from him. is there any way I can fix this or is it supposed to be this way? I'm having the same problem as eurekaitsannie. I checked a let's play on Youtube and it didn't happen for that person, is this a bug or something? It's very annoying because I don't feel like going through The Room at 10 times slower than the normal speed. I also am having the same bug occur where I am moving at an incredibly slow pace, this is a bit irritating unless it is meant to be like this, anyone know a solution? I need some help installing this game. HOW DO I DO IT? I know that I am missing something very basic here, but I need it explained to me. I downloaded the file from a website. Because it is a zip file, it was automatically unzipped by the program I have on my computer. I then installed the font files I saw. Now, how do I play the game? mynameissarahkelly, you don't need to install the game itself. Just open the application in the folder of the game (I think it called RPG_RT.exe). I figured it out shortly after posting that comment. Thank you. the man who is supposed to sell me the page just says "the mall is full of specters. Its terribly frightening." Having a look at the physical progression of monsters in the purified zones. Zone 1, eyes ears arms legs all present; Zone 2, hands and feet missing, eyes "welded" over; Zone 3, limbs missing, face nothing but a mask. It's either a blunt inspection of the Batter's child's state of being, or an introspective allusion to the child's own state of being and feelings of being "locked-in". You might have exited through the wrong way. You should head south when the wall shows a left arrow. Then one of the three people in that section will sell you the card. OK! so I'm stuck on Zone 3 area 3 and its saying I need more health points! how do I get more HP to get down into the factory!!!??? for some reason i dont have page 8? Ok, Im in the room in block one, i answered all the questions the elsen asked me wrong and then went to all the purified zones. anyway im back at the room and they keep saying i cant play this game until tomorrow, is there anything to do to reset the questions?? @MissLink8: Yeesh, I'm not familiar with that! I guess levelling up hasn't helped? Anyone else have any idea? isn't in the library. Go outside and find the route to the Park, not that you can reach the park just yet. You'll need some cash, but unless you just blew it all at the shop, that should be chump change. @The post above me: I'm afraid not! Unless you have an older save lying around, those are one-shot only! You'll be able to cope, I'm sure. Go a bit further and there's a shop with near-as-good stuff one way or another! I'm at the library in zone 2. I arranged all of the pages in the correct books, but the man at the desk wont give me access to the fourth floor. Need help on final boss. I literally just beat Sugar and now I'm ready to fight the Queen but I don't have credits to buy flesh or tickets, so should I go back and grind for credits or just go for it? Is she harder than Sugar? Sugar is the toughest boss in the game (I think I read somewhere she has 12000 HP....?) The Queen isn't all that bad, I don't think I needed to heal at all for her and I know I didn't have to use any flesh (except for maybe the third Add-On with the name I can't remember, but its moves cost 25 CP each or something...) and (speaking of CP) if you do need to heal, you have The Batter's save base competence moves. you already have the horoscope orbs from earlier in zone 1, but after that, there's another set of orbs that you can pick up by going to the left area of the amusement park after the elsens begin panicking and going up to the roller coaster. At the top of the roller coaster, you can push zacharie's statue to ride with you and when you're done, you can talk to the else's at the photo booth and grab your photo together. That photo serves as proof to the elsen on the bottom of the right room as access, and voila, treasure chests and orbs. But I haven't tried it by first getting the orbs from the ghosts, because I skipped over it the first time. Anyway, hope that's useful! @Arkaya Loghel: you can flee by using the attack option. After clicking Attack, scroll down (Under competence and Objects etc.) until you find the Flee option. I really like this game, but my complaint is that the secret ending is really off space. The Person that controlls the batter is a space robot monkey that was sent to use the batter to destroy the planet, so his species could use the planet as a robot building factory to fight another race of aliens?Only 3 words: What the fu**. suddenly, my down arrow key stopped working. After shuffling around the bottom of the screen and getting into a battle later on, I eventually got game over and was sent to the menu screen. The arrow key still didn't work there, either. Sorry, I was confusing the name of the zone I was in for the nothingness. Firstly; What's going on with that Zachary? I was kind of disturbed by his whole character. So I thought about it a bit more and did some research. What I found out is that the name Zachary originates from the Bible and referrers to the father of John the Baptist. So this guy had been silenced because he would not believe the message of the angels and was only cured after the birth of John. Since the in-game Zachary wears this surgical mask (which also makes sense being interpreted as a part of a clinic or so) he could be symbolic for the father's part of his soul that had been "silenced", sort of numbed, because the father does not believe in the rescue, the survival of his son. You never see Zachary taking of his mask, implying that the father never sees his son being rescued and therefore never cures himself. Furthermore there is the thing about Val(l)erie (how is it spelled properly? O_O can't remember); However, his name's origin seems to be Valerius (latin), meaning The Strong one. he is already consumed by the madness around him, he becomes body to the keeper of his zone and starts talking with his words: I am the keeper of the zone, everything exists because of me, I have the total power and can eliminate all of you if I want to. I believe all of those aspects together could mean that he, as a brother of the judge, who was already interpreted in the "right" (there really wouldn't be a right or wrong in this game) way as I believe, represents the conscious MISjudgment, the failure to see things realistic. It is the part of the father that is being consumed while trying to pretend that he has the situation - the illness of his son - under control.It is the part in a man that he himself would call his "Strong" side, however, it is nothing but a lie, a game of pretending. did anyone else notice the strange names of the bats? ... I believe they all seemed somehow holy/ angelic. maybe a symbol for the "higher power"? Have a peculiar class naming system. i looked at his wiki page and someone said for the strategy, i should have save 2nd base? i don't have it though is there any way i could get it, or am i too late? I was wondering if anyone could help me here. When I get to into The Nothingness, all there is is a black space and a white dot in the corner, and when i go over the dot, it says that i need a zodiac card? how do i get that? i cant get out of the small black space, is there just something wrong with the download or am i mistaken? Did anyone else actually ponder the fact that Zacharie own the Amusement Park in the place where people are afraid to live. Going by this, maybe he's Hugo's older brother in a way. He's trying to get people to live, yet he's still helping the Batter, but he's also the only one to call the Judge 'Pablo' which actually means Small. And on the subject of the Judge, his design may be Cheshire Cat inspired, he struck me as one as well. Helping but not, omnipotent, and able to travel freely. There's some great interpretations here. I somehow missed major plot chunks, but I think my own analysis, which is considerably different for that reason, still holds up. First off, I think [superego] is spot on. The batter is the id, the player, the ego, and the judge the superego. In the end you, as the executer, get to choose between the two. Besides that, I somehow missed all the plot of the dying baby and the batter being the father so my thoughts on the game are probably not quite up to par. Somehow I got the impression that The Room segment was flashbacks of his childhood? I thought the zones in their original state were symbolic of superficiality. They were very interesting, probably the most aesthetically pleasing part of the game, but their contents, namely the characters, were flat and dull. Each of the elements screams consumerism to me. I was sure it was satire, especially since the NPCs believed in nothing else. Each respective city of zone one mirrored the classic capitalistic company; they all produced as much as possible at any cost, saw nothing but advancement in their work, and honestly believed what they were doing was good, even when it was slicing open a living cow. If you consider each element and the purpose it's put to, bright colors can't mask the similarities to our own world. Need I mention the shopping mall? Safety was another theme that's very relatable. With every freak accident government enforces stricter laws and people become more paranoid. They honestly believe there is danger where there is none and as a result have no concept of joy or thought. Zone three brought the other extreme into perspective with this demanding work place where people believe they're happy simply because they're told so. They blindly accept propaganda and do their work with similar conviction to those in zone one. As for the battles, I'd like to explore [Alice's] idea further. Ghosts, whales, scary business men... it all does seem a little cartoonish. But these are very real, if foolish, fears people have. I believe they're another element to the shallow facade these zones present. We occupy ourselves with ludicrous worries to cover up the other ones. The deeper ones do show up, though, in the game as well as life. When the batter purifies the zones, they transform. Suddenly, he's fighting monstrous babies, perhaps reflections of his own, as was previously suggested. Things aren't so bouncy, but they're more realistic. The fear he has of what to do about his child (evidently; just going by the other comments here) permeates, as does the cold desolation of this alternate perspective of the zone. Perhaps zone zero's staying intact is meant to show that not everything is dark. The final state of being was flipping the switch. Nothing. Death. So in the end I think the dilemma the player is faced with is whether a superficial but outwardly pretty world, a fractured and tragic but honest world, or the absence of anything is better. The secret ending, which I'll admit I did not play, would slid nicely into place. After scavenging for these five pinpoints of superficiality, you get an equally superficial and safe end. Personally, I like the Judge's ending best, but the decision is left up to you. Okay, so I just started playing and I got to the first save point and it says I got the Leo card, but when I try to go into the room, it says I don't have the zodiac card for it...Is anyone else having this problem? I can't find the card anywhere. After I battle Enoch in Area 4 of Zone 3, I get a message saying "game is over" and taking me back to the title screen! When I continue my game, it just takes me back to my last save! Alright so I'm in Zone 2 and I was surprised to not see anything about the Roller Coaster you can go to by going left from the Outer Area. After switching the...switch...in the Plastic Pools, go to the Roller Coaster. Go up and then up again through the long staircase. There you see a statue of Zacharie and a roller coaster on the left of it ready to go. The Batter prefers to sit in the front, so push the statue from behind and continue to maneuver it until you push it from the right side and into the roller coaster's first seat continue pushing it to the farthest part of the first car so that The Batter can sit with it. Ride the roller coaster and get your picture from the man at the booth. He'll envy the fact that you got to ride "with the owner". Now, if you remember, at the Plastic Pools there was a man that wouldn't let you into the owner's office unless you had proof that you knew him personally. With that picture you just took, you now have that proof! Go back to the Outer Area and to the Plastic Pools (right) and show him your proof. 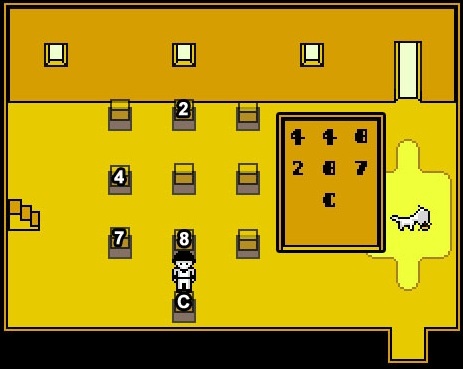 Zacharie won't be in the room, but there's a CRAPTON of treasure to get at! I just beat the game, but I don't recall running into Sugar at any point in time. Is she supposed to be a hidden character or something? @Arkaya Logel (and anyone else with this problem). The greyed out flee option on the first battle screen (with 'attack' and 'auto') can only be a selectable option when the Batter catches an enemy off guard. This happens rarely, only twice it's happened for me, but it's true. You'll know you've caught an enemy off guard because the game tells you as soon as you enter the battle screen. Otherwise, just wait until the Batter can take a turn, and then keep going down the list past 'objects' and there will be more options, among these the option to flee. Oh and also, has anyone come across a time when the greyed out 'save' option on the pause menu has been accessible? I'm not sure if it is just a bug...? Hi I'm having some trouble with floor 3 in the library on Zone 2. Something must've glitched becuase i do not have page 33 (8 of hearts) in my objects list. So i'm a little stuck. Any suggestions? You're not experiencing a bug or glitch. The 8 of hearts page is found at a separate location. Please refer to the Zone 2 - Outer Area section of the walkthrough above the comments for the step-by-step instructions to find that particular page. Yes, I believe that you first need to complete the other purified zones and collect their respective elements before you can return to Zone 0 to fight Sugar. I'm in Mary McCormick's situation. I just barely beat Enoch...his head was blown off. Then I got the "game is over" screen too. ooOHHHH PPPBBBTHHH Thank you Trinn! Haha i feel extremely stupid! Sorry about that! In case you or anyone else who has this same problem hasn't figured this out, you're just going to have to replay from your last save point. I did, and the second time, the game continued as usual. Help, so we only get one chance to answer the questions in the World within the window? do i have to start over if i get them wrong? Zacharies second mask seems to resemble a happy version of Valarie. Assuming that Valarie is also a part of the Batters conscience, closely related to the judge (the superego) and possibly/probably even a part of it, why does Zacharie wear this mask? Zacharie is probably using this to appear to be a part of the Batters conscience and strength, and ultimately an ally, but is using it to make the batter trust him more and give him credits more easily. My theory is that Zacharie has some kind of business partnership with the batter in real life, and is trying to get get money out of him. However he say's that he is friends with the Judge- he's familiar with the Pablo's more controlling superego and is happy to replace him while he mourns his brother. It's easier to get money from someone whose judgement is impaired. He's happy to support the batter in wanting to purify everything and turn the switch off because keeping Hugo alive is probably pretty expensive especially if there's nothing that can be done anyways. So what do you people think credits really are? are they money, acknowledgement, something Hugo dreamt up? 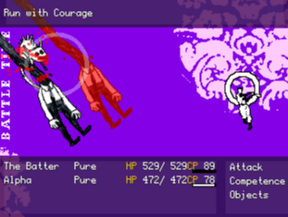 Batter died anyway, but I'm wondering if Zacharie survived or not. And during my gameplay, I didn't encounter Sugar. Not even once. Oh man so I'm stuck in "The Room". I'm in front of the giant elsen where he's asking fo give him a random number. The two numbers I've got are 5865 and 3755, but neither of them are working?? I'm afraid I may have missed something or maybe even my game is glitching up. Heelllppp please! Hey can someone help me? I've gone into the library without buying page 33(8 of hearts), and I picked up page 33(3 of clubs). So now I can't get the page I need. Does anyone know how to get rid of the page? Hey, I�m in the room, but I was just quickly spacing through conversations so I got a question wrong :( That was yesterday, so I assumed "We can�t play that game again today" meant "lolz, try again tomomrrow", but apparently that�s not it. Then I checked the walkthrough, it says I only had one chance. Does that mean I have to start all over again? I'm a little stuck! I just finished purifying all of the zones, and now that I'm going through the purified zones I can't access my menu anymore? I need to equip my team with better stuff before I face Sugar, which is next. Has anyone else had this problem/know the solution? My game won't let me flee in the battle with Enoch and I just keep fighting and checking to see if I can flee and I can't. Why is this happening..? To flee from Enoch you need to go The Batter's battle menu (NOT the main battle menu that has "Attack" and "Auto") and scroll down. There is another Flee option in there that isn't greyed out. I had to refer to the walkthrough for that when I got stuck. It's not that intuitive. I'm stuck in The Room. I'm stuck on Block 3 in Chapter 3 where everything is upside down. I go to the door I'm supposed to on the upper right but The Batter says "Something isn't working here. . ." and I can't do go through the door. I must have missed something somewhere but I don't know what. Ok, quick question for the 'Purified zones and the Room' walkthrough! So I gave the music box to Zacharie way back in zone 3, so I can't use it, and on top of that,I already answered the questions in the Room (Block1) incorrectly, thinking I'd get another chance, but I didn't save my game (I only have two blocks of data, one where I'm at the very start of the game, the other holding the data for the point I'm at now, which is the room) so do I have to redo almost the ENTIRE game over again to get it right, or is there a way around it? Okay, I've been playing the game for a while now with no problems, except there are occasions (pretty rare) that the screen flickers red when I walk anywhere. Is that normal, or ... ? I'm stuck at the Ecoch Room! It won't let me flee, and I've never had the option to in battle?Help!! Hey everyone, I need some help with OFF, when I save from one of the boxes in-game I can't come back to that save later. I launch the app form winrar but the start menu doesn't give me the option to continue. Am I doing something wrong? Am I supposed to save a different way? Some help would be really appreciated, I'd like to start playing again. Thanks! Ok, so I played part of the game and got pretty far - to zone 3, saving as I went. However, when I quit the game and then opened it up later from the zip file all my progress had been lost, and 'new game' was the only option there! I tried moving the application to my desktop, but then when trying to load the game a french error message came up :( any ideas of what I'm doing wrong? hey, does anybody get a glitch where music refuses to play? the only time it's happened is when i battle japhet, but it keeps happening at that exact point and it's never happened before. Uh, why don't you put the roller coaster ester egg? um excuse me. but I am on zone 3. I am in the room with the controller. and when I click it. it gives me an error message saying: (???snes??) whats that mean? There is an unofficial sequel being made that is in the Beta stage. It is called "HOME"
I took on the 3rd boss and didn't flee, I'm half an hour into the fight and out of cp items and on my last fortune ticket. The boss seems to be decomposing sightly but isnt wearing down; HELP! I've encountered a glitch; can anyone help? UPDATE: The up arrow key doesn't work in-game anymore. Also, I've tried making a new save but the glitch is there, too. Nevermind, I restarted my computer and the problem seems to have fixed itself. I would like to point out that the download link is broken and I use this page to tell my friends about OFF. It would be nice if you could fix it. Pay attention to what the opposing elsen does. You always want the sum of both of your turns to be 4. For example, if he pops one balloon, you pop 3. If he pops 2, you pop 2, and so on. Hey, I'm in the Enoch's Floor on the zone 4 but I can't use the "flee" option!! What do I do?! I need some help and I feel like an idiot for asking. but..
when your suppose to fight enoch my game wont let me flee. I don't know what to do and its starting to annoy me. especially because this is my second time playing this game. Hello! I'm aware this is quite and old thread, but I was hoping for a little help, seeing as I can't find an answer anywhere else.. In the first Purified Zone, how do I enter the hidden room? When I walk up to it, Batter comments that "There's a door. But it seems to be locked from the inside." help with this would be much appreciated. Thank you! I'm stuck in the maze and have tried to use the escape posted in the walkthrough but to no avail. Am i supposed to follow the routes from the point that the previous had left off or??? Thank you. aaaah omg im stuck at the part in zone 3 where you need to input the password on the video game controller because it wont let me input J or left........is anyone else having the same problem or.........? Whenever I enter the password, right when i enter the first D, the screen fades to black and resumes back in the game. Can somebody help me? That means somebody in your team is poisoned or infected of something. I suggest checking your party. near the door, is two posts diagonally connected to eachother, and a lamp. Interact with that and Batter will say "There seems to be a lever here" Or something like that. If you choose to pull the lever, you will be able to go inside the room. You probably just solved it as i write, but I hope this helped! I dont mean to sound like a broken record, and you probably solved it, But if you go to Batter's options, scroll down and it will say 'Flee' If it doesnt let you flee, keep your add-ons to defending until Batter is able to flee. Hope this helped! It takes a while, and I know how you feel. Hey I'm just wondering, does the additionaly party member Alpha stay with you for the whole game? I want to know if it's worth upgrading its stats with the orbs. Okay, so, ever since Area 4 of Zone 3, the Batter has been moving at a super slow speed, and it is getting to be quite annoying. I finished Zone 3 without any problems, but now I've noticed something else. 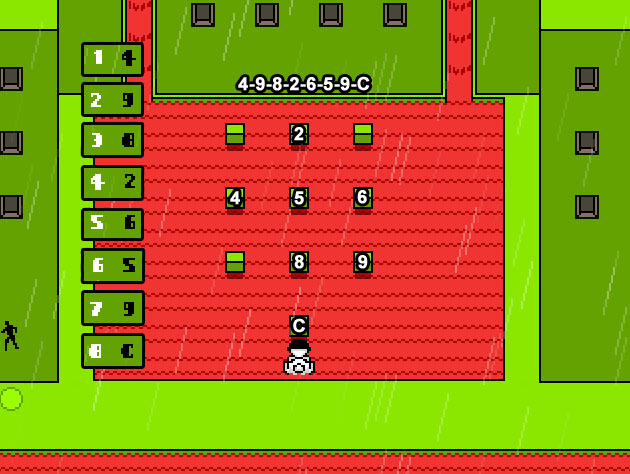 Not only am I walking at a very slow pace, but I returned to Zone 0 after defeating the Zone 3 boss, and I do not see any stairs in the "number room", and therefore can not get to the Sugar boss. Any way to fix either of these things?? There is actually a problem with your Zone 1, Alma, Meat Fountains, Pedalo suzzle code. It's actually 4-9-8-2-6-5-9-C. The 5 and the 6 were just switched. Or maybe that's just my version, who knows. I'm also having trouble fleeing from Enoch. I've continuously waiting for the Batter's turn and trying to flee, but the option is still inaccessible. Okay, so, I literally just started playing the game, and it seems great. I've been waiting all day to play it, but when I actually launched it, the controls weren't working at all. I pressed pretty much every button I could think of, looked it up, and tried clicking on the screen, but nothing works. Occasionally, it proceeds on it's own, and I managed to get to the name selection by spamming, but I can't actually play like this. Might there be a solution? Competences I acquired are grayed out and I cannot use them... Not all are grayed out, just some, like 'furious homerun' etc. I don't know why they are grayed out? Is there something else I have to do to activate them? But then some of my other competences work fine? EDIT: nvm, figured out what it was. Hi there! Sorry you're having trouble. Are you sure you're looking at the right password? 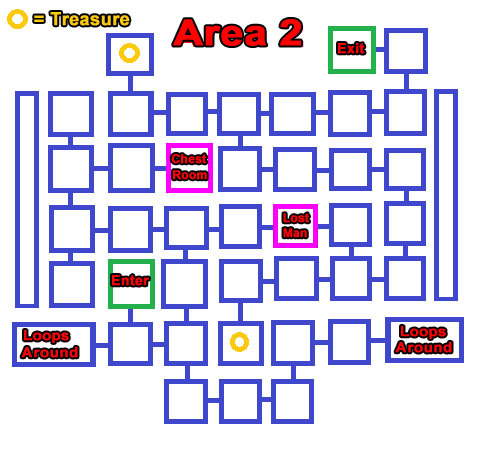 According to our walkthrough, Von Gacy is the password for Area 2 in Zone 3, not the first purification zone. Probably my favourite RPGmaker game of all time. I registered only so I could tell you guys; there's no need to answer the questions in The Room. Just keep going with the puzzles. Alright, so I have a bug. You know how in Zone 3 you join Zacharie in the train? A bug happens when you dont speak to him facing him in front of him once the train stops. That bug is slow walking for the rest of the game. Is there a way to fix this bug? Does this only happen rarely? Im just a guy who needs help. There's a Mac version of this now, might want to update.